The per user subscription fee is lower than when everyone buys an individual subscription. The administrator controls the accounts. This can be very important, see at bottom of page. A member of a multi-user license has the complete Pro functionality. So the person can create meetings, use templates, and information is stored longer. You can access the multi-user account setting under My Account. When is account control important? The account control can be very important in case a person leaves your organization. 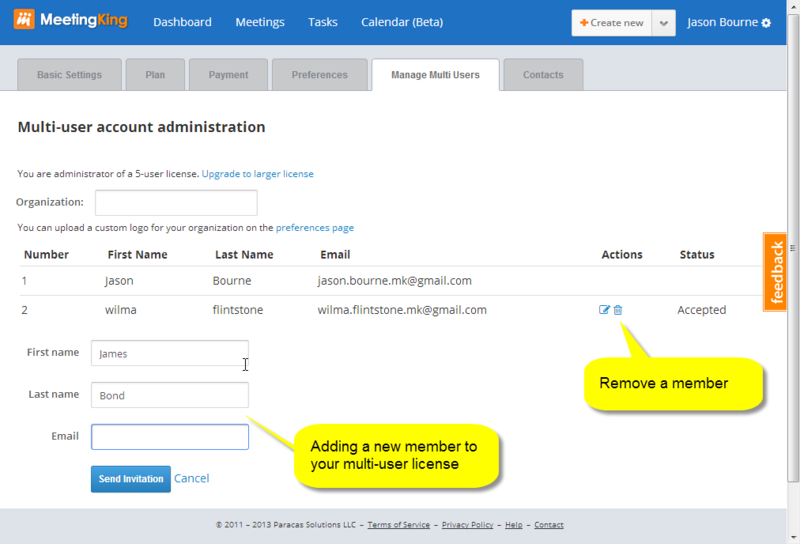 If the person is a member of a multi-user license the administrator can simply cancel the account and the person cannot access any information from past meetings anymore. If someone has an individual Pro account or a free account, that person can continue to access any past meetings they were part of, because they control that account and not the company administrator. Of course, you can remove such a contact from past meetings, but that is more work than simply disabling the account.